BROOKHAVEN, Miss. (AP) — Mississippi’s governor on Wednesday awarded a state medal to a slain police officer, as relatives and law enforcement personnel mourned his death. Gov. Phil Bryant awarded the Mississippi Medal of Valor posthumously to Brookhaven police officer James White at his funeral Wednesday in the southwest Mississippi city. White and 31-year-old Cpl. Zach Moak died from gunshot wounds Saturday after responding to a call. Police say that 25-year-old Marquis Flowers shot the men. “Valor, what a perfect word for today,” said Bryant. White was eligible for the honor because he was a former Army National Guard member who was awarded a Purple Heart during service in Iraq as an 18-year-old. The Rev. Mike McKee said White, whom he knew as Kevin, was one of the few people he knew when he first moved to Brookhaven. Flowers, who had a series of previous felony convictions, was free on bail at the time of the shooting. He’s been hospitalized and hasn’t been officially charged yet. Police have questioned others, but it’s unclear if they will pursue charges against anyone else. White’s sister, Lisa White, read a passage her brother had written about serving as an officer. “All that matters is when they need me, I’m coming,” White read, fighting back tears. The funeral was followed by a procession of more than 50 police motorcycles and 100 police vehicles to a rural cemetery. 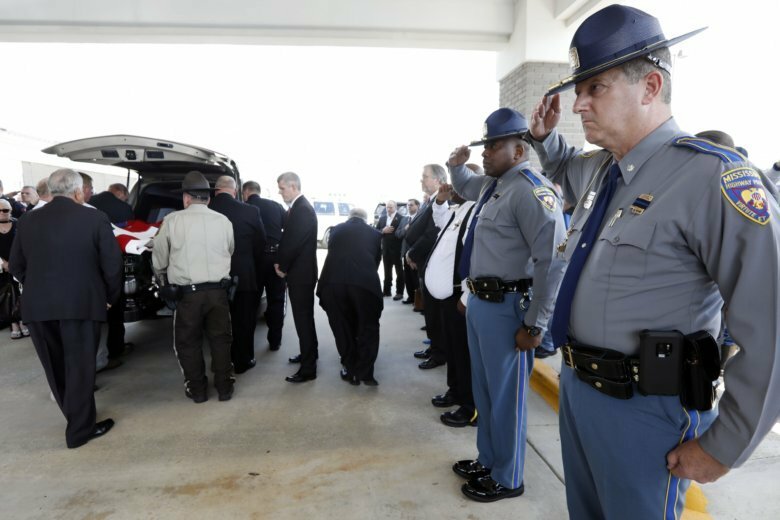 Officers stood at attention and saluted as a flag-draped coffin was wheeled from the church and loaded in a hearse as family members cried, one clutching a Mississippi state flag given to her. The funeral came after a member of a Patriot Guard motorcycle group traveling to honor White died in a crash. The Mississippi Highway Patrol said 66-year-old Kenneth D. Deroche of Franklinton, Louisiana, lost control of his motorcycle and was thrown. Deroche was pronounced dead at a Brookhaven hospital. A second Franklinton man who crashed, 73-year-old Martin Walton, was taken by helicopter to a Jackson hospital with serious injuries. Moak’s funeral is scheduled for Thursday.